(i) Autism means a developmental disability significantly affecting verbal and nonverbal communication and social interaction, generally evident before age three, that adversely affects a child's educational performance. Other characteristics often associated with autism are engagement in repetitive activities and stereotyped movements, resistance to environmental change or change in daily routines, and unusual responses to sensory experiences. (ii) Autism does not apply if a child's educational performance is adversely affected primarily because the child has an emotional disturbance, as defined in paragraph (c)(4) of this section. (iii) A child who manifests the characteristics of autism after age three could be identified as having autism if the criteria in paragraph (c)(1)(i) of this section are satisfied. 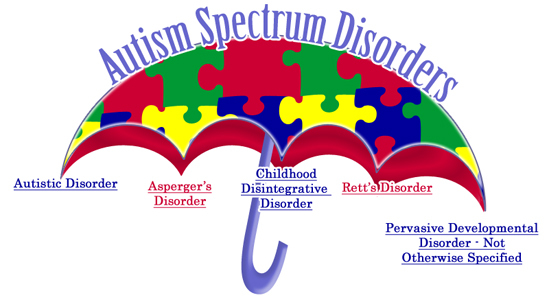 Autistic Disorder: is generally what people think of when they hear Autism. Children with autistic disorder have communicative and social impairments. Asperger's Syndrome: tend to have the same social and communicative impairments but have an average-high IQ. Rett's Syndrome: is primarily found in girls. Children with Rett's begin developing normally but start to lose the communicative and social skills. Children with Rett's tend to have a significant cognitive impairment.